This is my first post, but I've been lurking off and on for over a year - hello! About 18 months ago, I decided to embrace the wave/curl, which led me to this site. I learned a lot from reading the articles and lurking on the boards and switched to sulfate and silicone-free products. My hair feels so much healthier now, but I haven't found any holy grail products...not for lack of buying stuff, but probably because I haven't gotten the hang of using them. I've tried watching youtube videos and it seems simple, but nothing seems to work for my hair the way it does in the video. My hair is fine, medium porosity, medium-to-high density. With my sub-par styling techniques, it ends up looking 2B...but when I first get out of the shower and scrunch it, I have spirals that look like they could be 2C/3A if I could master styling it. I recently chopped it to shoulder-length (it had previously been just past bra-strap length) and I love the new length - it's so much lighter and if I could get the spirals to stay, they would be very cute. I air-dry because for me, the entire point of wearing it wavy is to avoid blow-drying. I am open to any and all suggestions! First problem: I have never managed to successfully scrunch out the crunch, so I avoid any hard-hold products. I've tried experimenting with more or less product, scrunching with or without water, different ways of scrunching, more or less scrunching...it never fails, if I try to scrunch it at all when it's dry, it turns into a frizzy mess and I still have crunchy bits. Any ideas, or do hard-hold products just not work for some hair? Second problem: Even with lighter-hold products, it dries with a 'wet look,' so I feel like I need to do something. When I do nothing and let it dry, I generally have looser waves on the bottom layers and spirals on the top layers. The looser waves look straggly and the spirals lay flat with no body. Overall, my ends (which are healthy), end up looking straggly. Like with hard-hold gel, if I mess with the spirals too much, they frizz. 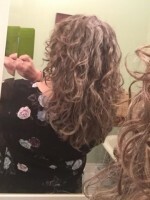 To be honest, my hair looks best if I let it dry, then brush it lightly - which I know you're not supposed to do, but it's the only technique I've tried that gets rid of that straggly, wet-when-dry look. If I brush the top layers very lightly (once), it destroys the spirals, but leaves me with 2B waves. I then run the brush through the lower layers and my ends to get rid of the straggly look. The end result looks 2B - which I can live with, but I'd love to let it do it's spiraly thing if it's just a matter of learning the right technique. Any suggestions? What products are you using? Maybe we can suggest something that will work better. When are you applying your styling products? I've found it best to apply on drippy wet hair, so as soon as I rinse, I apply my gel, then grab my hair towel and squish dry. On the other hand, some people do better applying their stylers on towel dried hair. You might want to experiment with that. You're not alone, love! I used to hate the crunchy and weird wet look whenever I used curl cream/gel. But 'lo and behold I learned to love them because my curls stays defined for up to 3 days max because of the crunchy process. Of course we still gotta scrunch them out (with or without oil) BUT only when they're 100% dry (if you're air dryig). Oftentimes when I'm in a hurry I diffuse when I feel like it's 75% dry (still somewhat wet but mostly dry - I plop beforehand for 20 min to speed up the drying process). Scrunch/diffuse fr side to side then with your hair in front. If it's still crunchy despite diffusing or scrunching the heck out of it what I do is I put all my hair in a pineapple for a few minutes then that usually takes all the crunch out. Also, I am also a 2c/3a gal and find my hair is curlier (more 3a) whenever I diffuse. Experiment, experiment. You'll eventually find what works best for you. Hope this helps! Thank you both! I know it's a process of experimenting, but sometimes I feel like I'll never get there. Yikes, 3-day hair from crunchy gel! I hear of such things, but at this point I'd settle for same-day afternoon hair. I've never managed to 'revive' my hair for a second day without wetting it completely and styling again from scratch. When I sleep on it, I wake up with medusa hair - and then when I touch it to try to fix it, it frizzes. It is shoulder-length, too short to pineapple or braid overnight. Any ideas? I always air-dry...mostly because my toddler does not allow me the alone time it would take to blow-dry my hair. To be honest, though, I also stink at blow-drying, with or without a diffuser. I haven't tried it often with a diffuser, but since it's freezing in my bathroom in the morning at this time of year, now would be a great time to experiment, at least on days when my son sleeps a little later than usual. For products, my hair looks best when I wash it every 2-3 days. I've tried several sulfate-free shampoos and it doesn't seem to make a difference. Right now, I am using DevaCurl low-poo. Suave essentials for conditioner, though many conditioners work great for me (Shea Moisture conditioners did not - I tried several and my hair was very soft and flat when I used them, regardless of what else I used). I am generally happiest with my hair when I use Curl Junkie Curls in a Bottle and then DevaCurl volumizing foam. I've tried other products and have a cabinet full of things to experiment with, but I always end up coming back to this combination. I apply them to dripping wet hair, scrunch, then plop for about ten minutes. I then have maybe 30 minutes until I leave my house, so there's a rather short window for doing anything else to it like clipping, etc. It takes about 3 hours to air-dry, so I am leaving the house with wet hair. If I could solve the overnight hair issue and get a couple days out of it, that would be life-changing. I could spend more time on my hair in the evening than I can in the morning. But it goes flat and very messy overnight, so I'm not sure what to do with it. What gels are you using that give you a gel cast? Also, do you know where you fall on the protein sensitivity spectrum? I also have 2c/3a hair out of the shower. For me, frizz is a huge problem. I've noticed that scrunching/touching too much when dry and not enough moisture are my biggest issues. Using more leave-in/conditioner has helped my frizz a lot (I leave in my daily conditioner and also add a little more leave in after showering). Also, my hair likes creams (i.e. DevaCurl supercream, CJ CCCL). I usually do a leave-in and cream styler on dripping wet hair, scrunch with my hands to get out some of the water, then apply gel (i.e. DevaCurl Ultra Defining Gel). Then I can scrunch with microfiber towel and add a little more gel. Not sure if a cream/gel combo would work better for you? I'm not sure what gel combos you have been trying before. Harder holding gels help keep my curls, along with tons of protein in my regimen (why I asked where you fall on that spectrum). I'll plop for about 30 minutes after this to let my hair dry a little on my head. At night I will spray a little leave-in on my hair for moisture. For second day hair I like to mix water with leave-in in my hands (put product in one hand, quickly wet other hand under running water, then mix) and smooth it over the canopy and scrunch into bottom layers. I then repeat with KCCC. I noticed KCCC tends to loosen my curl pattern, but it is AWESOME for my second-day frizz (probably because it so moisturizing and that is one of my key problems). The other thing I'm wondering about is your length? I think my hair get curlier as it gets longer, but I'm wondering if the weight when wet is elongating my curls (possibly yours)? Plopping could be helpful (for me it definitely is). Sorry for the huge post! Experimenting with: jessicurl, oidad, CJ, protein!